We had just a little bit of time to have dinner as we were headed out to see the Vancouver-based The 605 Collective at American Dance Festival. My wife had picked up from the farmer's market some dandelion greens. 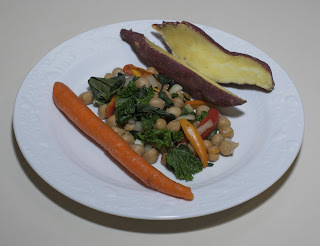 I don't cook with them but was inspired by a bean-and-greens recipe that I found. Briefly, I tore the greens from the center stem by hand, then roughly chopped a bunch of dandelion greens into 3/4" wide strips across the leaves. I also hand tore about four kale leaves into 1 1/2" or so squares. In my Saladmaster saute pan, I sauteed with no added oil or anything else 1/4 of a yellow onion that I had cut into a 1/4" dice. As the onion clarified and just started to carmelize (medium heat, maybe 4 minutes or so), I added the greens, stirred for a minute, then added most of a 15 ounce can of drained and rinsed chickpeas, as well as four or five small baby bell peppers, cut into 1/4" wide strips. I mixed in a little bit of salt to taste and maybe 1/4" teaspoon of dried sage, plus a pinch of ground cumin. I also had baked a Japanese sweet potato, and served that, plus a carrot. The dandelion was still a little bitter after cooking, but I'm glad that I included the kale; the dish came out reasonably well, though I want to experiment more with dandelion greens, if my wife buys them again. A little bit of garlic could have been good in this dish, and maybe a 1/8 cup of tangerine or orange juice poured in during the last two minutes of cooking.